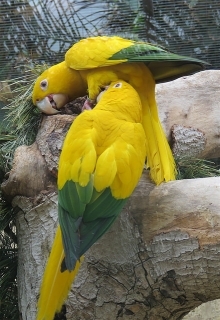 The Golden Conure will alternate different hollows for roosting on successive nights. Both adults plumage bright yellow, primary, secondary and outer upper wing coverts dark green; yellow tail. Bill horn in colour. Bare, pink/white eye ring, eye brown. As in adults but with dark green on cheeks and ear coverts; yellow crown, nape and upperparts, marked with dark green; underparts yellow; breast lightly marked with dull green; uppertail dark green marked yellow. Bill pink. Pale grey, bare eye ring. Vibrant, high pitched note given singly or as many as 3-4 per second; during courtship a long strident note. Voice in general softer than Aratinga conures. Vanished and Vanishing Parrots, Forshaw 2017. Cooked beans and pulses, boiled corn, sunflower seed - dry, soaked or sprouted, fruit such as: apple, orange, bananas, pomegranate, cactus fruits; vegetables such as: carrot, celery, green beans and peas in the pod; complete kibble; spray millet. Provide overhead misters or shallow water bowls for bathing; foot toys, destructible (non-toxic) toys, non-destructible (non-toxic plastic) toys, food-finder toys, preening toys, different texture and size hanging perch toys; bird-safe, unsprayed flowering, fir, elder, pine or willow branches, push-and-pull toys (sliding up and down), vegetable tanned leather toys. 12" x 12" x 18" (30.5cm x 30.5cm x 46cm) box, or 12" x 12" x 24" (30.5cm x 30.5cm x 61cm) box. Habitat loss and fragmentation, which is projected to increase. Populations have also been affected by trapping, persecution and hunting. N Brazil, where scattered populations are found south from the Amazon river to between the Rio Tapajós, western Pará and Rio Turiacu, western Maranhāo and the upper Rio Madeira and tributaries. Also northern Rondônia and NW Mato Grosso. Seen in humid lowland rainforest up to 500m (1640 ft), with occasional forays into varzéa forest. Also frequents grasslands with scattered trees. Birds feed on fruits, seeds, nuts, berries, buds and flowers. Bertholletia excela, Oenocarpus sp. palms, Symphonia sp. buds, Anacardium spp., Protium and Tetragastris spp. are some of the plants recorded as food sources. Is somewhat nomadic; will wander into different habitats post-breeding. Gregarious at all times of year, roosting and foraging in groups of 3-30 birds. Feeds quietly, mostly unseen, in the dense foliage of the canopy. 2 to 4, round to oval shaped, 34 x 29 mm (1.3 x 1.1 in). Breeds during wet season - November to February. Likely breeds communally with several females contributing to one large clutch with multiple attendants; single pairs nests also reported.